Planning an upcoming trip and want to secure cheap car hire prior to arriving at Burbank Airport, California? 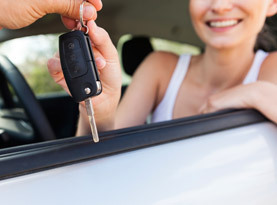 Comparing prices with several area car hire companies is only a few clicks away. It's as easy as entering your preferred pick up and drop off location at the Burbank Airport, car type and relevant dates of travel. Before clicking the button, be sure to enter the primary driver's age. All that's left is to sit back, wait for a personalised quote and book your car hire online. Burbank Airport is situated in the middle of downtown Los Angeles, Hollywood and the San Fernando Valley. Although the Metrolink train system and Burbank Bus connect visitors to central Los Angeles, picking up cheap car hire at Burbank Airport is the fastest option for accessing the city centre. Burbank Airport services incoming and outgoing flights along the west coast of the United States from airlines such as United Airways, Southwest Airlines and American Airlines. Booking car hire in advance at Burbank Airport is the easiest way to avoid confusion at the passenger arrival terminal. After picking up your car hire at Burbank Airport there are a number of sights to explore around the city. Disneyland, Universal Studios and Dodger Stadium are all popular attractions reachable with a hire car. For a taste of the cultural arts, visit the Getty Museum and enjoy artworks over a century old and a spectacular view of the city. The weather in southern California is moderate throughout the year. Because Burbank Airport is located in desert land, there isn't a typical rainy season. Winters (December to February) enjoy temperatures around 18 to 20˚C.